Dry needling provided by your Olathe acupuncture center is a treatment modality that utilizes Trigger Point Therapy to treat a number of different ailments and conditions. 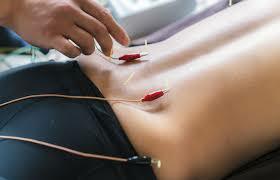 This procedure is typically performed by a dry needling chiropractor or another health practitioner. Your acupuncture chiropractor at Complete Care Chiropractic KC offers dry needling acupuncture in Olathe as a complementary treatment to many chiropractic techniques. This treatment option is most effective in cases that involve soft tissue and muscle injuries and pain. Your dry needling acupuncture chiropractor will utilize an ultra-fine needle that they will use to stimulate hypersensitive muscles and soft tissue trigger points. The technique is an effective treatment for any injury or condition that causes pain or discomfort in the muscles or soft tissue of the body. The dry needling chiropractor at Complete Care Chiropractic KC can review your case and determine if dry needling is an effective treatment option for you. Many of the conditions that are effectively treated by dry needling include pain in the soft tissue areas of the body such as the hamstrings, neck, forearms, lower back, jaw area, neck and shoulders, and calves. If you have an injury due to repetitive motion at your job or overuse your computer your Olathe acupuncture center can help. Complete Care Chiropractic KC is here to treat your physical conditions in the most effective manner possible, and we have found that many of our patients benefit from a dual-modality course of treatment that includes both chiropractic care and dry needling. If you would like to learn more about dry needling acupuncture in Olathe please call us today at (913) 815-8076 to schedule a consultation and learn more! Complete Care Chiropractic KC is conveniently located at 784 North Ridgeview Road in Olathe. We look forward to treating you soon!